It’s 28 years since my Dad died. Yet, barely a day goes by without me remembering some saying of his or wondering what would he have made of the roller coaster of current events. Each day, looking in the mirror, I resemble him more and more. And, each day, I wish I could reach my hand out to hold his once more. Until that day all I can do is remember him in my prayers, honour him in my actions and stumblingly capture him with my words. Fathers and Sons. Sons and Fathers. Sons carry their Father’s in their bloodstream, in their mannerisms and gestures and in the echoing halls of their memories. No matter what you do in life, no matter how radically you roam from where you started you remain in some part of you (in more parts that you usually like to acknowledge) your Father’s son. Coming to terms with your Father, the Son you were and are and the man and Father you have become is the work of a lifetime. A story that’s always unfolding, always being rewritten as you learn more about the man you are and understand more about the man your Father was. Sons, schooled by the abrasive tides of life, sometimes learn to have a certain humility about the easy certainties of their youth as to who their Fathers was and what made him that way. It’s easy to be a Father until you become one. Sons writing about Father’s is one of the great themes of all literature and songwriting because that story is always current, always unfolding, always full to the brim with all that is human in all its bloody and terrible glory. No two stories of Fathers and Sons are the same though most will recognise something of themselves in every story. Here’s a cry from the soul. Paul Simon’s, ‘Maybe I Think Too Much’ from his aptly titled, ‘Hearts And Bones’ record. Fathers and Sons – Hearts and Bones, Hearts and Bones. Sons never know when they will need to call for their Fathers to appear in their dreams. The song about Father’s and Sons that grips my heart every time I hear it and which calls to me in the middle of the night is John Gorka’s, ‘The Mercy Of The Wheels’. Forgive the initially muffled sound. You can almost hear this song echoing in the silence all around him. I walked many roads with my Father. I’ve walked many miles without him by my side now (though I sometimes feel his presence). I hope I have many miles to walk until I join him again. Thanks to Martin Doyle for featuring this tribute in The Irish Times. My Dad would have been very proud to see it there. Liverpool in the 1950s was a city filled with youthful dreamers. Of course, the quartet of dreamers who would go on to launch millions of dreams across the entire globe were John Lennon, Paul McCartney, George Harrison and Ringo Starr – The Beatles. But, dreaming alongside them and in their wake were thousands of other young men from the port city. Prominent among these dreamers were two brothers from Dingle in Liverpool; Freddie (born 23 October 1940) and Gerry (born 24 September 1942). Their father, also Fred, played the Ukulele and encouraged his sons to take up music. Fred chose the drums (initially playing percussion on a chocolate box tin!). Gerry took up the guitar and encouraged by family reactions to his spirited rendition of, ‘Ragtime Cowboy Joe’ elected himself lead singer. Skiffle sessions at local halls led to performances at larger venues. Les Chadwick joined on bass and later another Les, Les Maguire, joined on keyboards to complete the classic line up of Gerry and the Pacemakers. 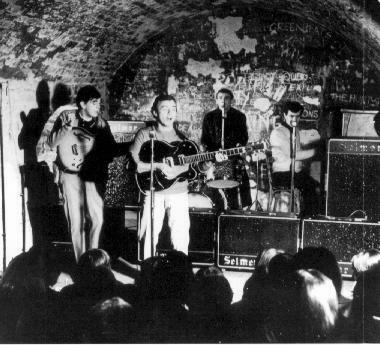 From 1960 onwards they built up a devoted following in their home town with many shows at The Cavern – often alternating with The Beatles. They had the great good fortune to be added at the last minute to a Liverpool show by the great Gene Vincent. Like The Beatles they honed their playing chops and their stamina by playing extended sets at Hamburg’s Top Ten Club. They became a tight Beat Group able to hold a crowd as they lashed into R&B and Rock ‘n’ Roll classics. Gerry was a natural front man with boundless energy and bonhomie. He was the epitome of what is known in Britain as a, ‘Cheeky Chappie’ – the kind of man who always sees the glass half-full not half-empty and who anticipates the rainbow following the rain. These qualities and the unity of the group was spotted by Brian Epstein. He signed them to a management deal (his second after The Beatles) and persuaded Producer George Martin to bring them on to EMI’s Columbia label. This proved to be a very astute move for all parties. For, incredibly, the first three Gerry and the Pacemakers singles all went to Number One in the UK Charts! They began in March and May 1963 with two (to my mind cheesy) Mitch Miller songs ‘How Do You Do It’ and ‘I Like It’. Then in October 1963 they issued a record which has become a part of the very fabric of life in Liverpool, ‘You’ll Never Walk Alone’. The group had been performing the 1945 Rodgers and Hammerstein Show Tune for several years and it had always proved a Show Stopper. George Martin, drawing on his classical training, provided a melting string arrangement to frame Gerry’s fervent vocal. Listening to Gerry sing here it becomes apparent that while his appearance and manner exuded sunny optimism his greatest gift as a singer was to embody shadow and melancholy. Indeed, taking the three records featured on The Jukebox today into account I have no hesitation in crowning Gerry as the Monarch of Mersey Melancholy! Gerry has the musical and emotional intelligence to trust in the craft of the melody and lyric and present them powerfully but not hysterically. So he is walking on – not running. There is a mature determination to outface the dark in this performance. Though he may have to button his coat and turn up his collar against a biting wind he has faith that every dark night gives way to the dawn. Gerry’s vocal makes you believe in the sweet silver song of the lark and the promise of the golden sky. ‘You’ll Never Walk Alone’ almost immediately on issue became the anthem of Liverpool Football Club. The players run out to the song and to hear it sung by the massed ranks of The Kop is one of the greatest sports experiences. It has taken on added depth and poignancy for Liverpool fans following the appalling tragedy at Hillsborough Stadium in April 1989 when 96 Liverpool fans lost their lives. Every rendition of the song is in a sense a memorial to the 96. Gerry and the Pacemakers had become big stars in the UK and in April 1964 they issued the record which, aided by appearances on Ed Sullivan and the overwhelming impact of The Beatles, would become their breakthrough in the American market, ‘Don’t Let the Sun Catch You Crying’ which made the top 5 in Billboard. This is my favourite of all their records and a gold plated 60s classic. Again George Martin was a key figure with a lovely arrangement expertly balancing strings, woodwinds and vocals to hugely winning effect. Gerry’s regal melancholy is in full flow here on a song credited to all four members of the group. Listening I imagine a shattered heart which has spent a long night without the balm of sleep. Yet, sometimes those white sleepless nights lead to moments of sudden, undeniable, clarity. Looking out a window, almost too tired for tears, you can only wait for the Moon to cede to the Sun in the heavens and believe in the latter’s restorative warmth. The last record I’m featuring here today is from late 1964/early 1965. It’s another record deeply redolent of life in the group’s native Liverpool, ‘Ferry Cross the Mersey’. There’s something about the tidal sway of a Ferry trip that encourages reverie and contemplation. This is beautifully captured in this Gerry Marsden song. ‘We don’t care what your name is boy – we’ll never turn you away’. We all need such a place for life does go on day after day and beating hearts can’t help but be torn in so many ways. Gerry and the Pacemakers broke up a group in late 1966 but the above trio of records will surely always earn them a secure place in the affections of those who need a reminder to not be afraid of the dark and to hold their head up high. Wishing Gerry Marsden a speedy recovery from his recent ill health. Make sure you check out the three other Posts in the ‘Some Other Guys’ series featuring The Merseybeats, The Swinging Blue Jeans & Billy Fury.